Custom Lanyards, Dye submilated in Full Color on both sides with Full Color PVC Badge. Price includes full color dye sublimation lanyard, with step and repeat imprint on both sides and full color 2 side pvc badge. Lanyard Size: 36" x 5/8", 36" x 3/4", or 36" x 1". Add safety detachable clip or buckle release for additional cost. Keep your brand in plain sight at all times with our Full Color Dye Sublimation Lanyards and PVC Badge! 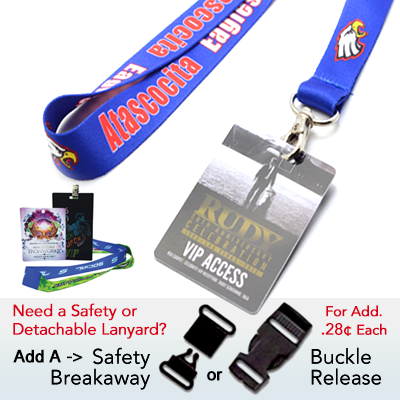 Your logo or design will be digitally transferred to a high quality micro weaved polyester material lanyards. Combined with a full color laminated PVC Credential Badge or event pass is a perfect solution for event badges, VIP passes, special events, music festivals, and more. Your order includes your choice of a free attachment: J-hook, Keyring, Bulldog, lobster attachment. You may also select a safety detachable clip or buckle release. Look the part! Have us print your companies full color lanyard and badge for your next event today! Dye Sublimated in Full Color on a Micro-Weave Polyester Lanyard 36" x 5/8". Select the desired clip attchment for your lanyard. Choose a safety or buckle attachment for an additional cost.